Surf and turf on a Monday night? With Julia gone this week on business, I had already decided to live the bachelor and non-vegetarian lifestyle and make myself a nice thick 10-ounce New York Strip that I had purchased last week in anticipation. But then the bunny needed food too, and I went to the store. I got Coal some nice fluffy kale, some dainty dandelion greens and some luxurious parsley that would all be sure to make him a happy camper. And then I passed nonchalantly by the fish counter and saw some awesome looking cooked lobster claws in the case for only $6 a pound with my VIC card. Not bad. I couldn't resist. Surf and turf it would be. I came home and fed Coal to make him happy, and then I focused on feeding myself. I decided I would sear the steak to a nice medium rare and make lobster sticky rice and a little side green salad. I shucked the lobster meat out of the claws, something I'm skilled at doing due to my great Massachusetts lineage. My $5 worth of lobster ended up being about 6 nice-sized claws and they yielded a nice amount of meat, which I broke into large chunks. For the claw joints, I decided it would be more worthwhile to use them as flavor than to actually extract their meat, so I threw the six claw joints into my rice as it was simmering with a little salt and Smart Balance. This imparted some nice subtle lobster tones into the rice. Meanwhile, I heated a very small amount of olive oil and Smart Balance over a medium to high heat for my steak. I lightly seasoned each side of my steak with a little kosher salt and fresh cracked pepper. Then I placed the steak down in the pan without moving it, so it could sear. After a few minutes I flipped it over so the other side could sear. Then I turned down the heat somewhat and continued cooking the steak for another few minutes on each side. I didn't really time, since I was using a meat thermometer to gauge doneness. When the meat center was at the rare temperature, I removed the steak, put it on a plate and covered it with foil to rest for several minutes to lock in the lovely juices. This would also let it get a little more medium without overcooking it. While the steak was resting, I took my shucked chunks of cooked lobster and put them in the pan that the steak had been in. I quickly sautéed the chunks for no more than 30 seconds, just to heat them but not overcook them, and to marry the flavors a bit. Then with a slotted spoon, I took the lobster out and placed it in the rice that was now finished (I had already removed and discarded the joints I used in the rice). I mixed the lobster into the rice, and a naturally stickiness developed as the rice and lobster melded. The last thing I did was deglaze my pan, as it had lots of little bits of steak and lobster on the bottom. I cooked off some champagne vinegar on high heat, scraping the bottom of the pan, until it thickened slightly, and I drizzled it over my steak. 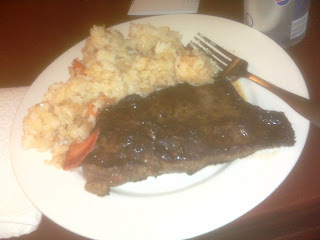 I plated the steak and a large scoop of the lobster sticky rice and put my little side salad in a separate bowl. There isn't much else to say: this meal was simply divine. The steak was cooked perfectly: a deep rose-pink all the way through, a nice, colorful crust all the way around and each bite bursting with flavor from the quality of the meat, my seasoning and the deglazed juices at the end. The lobster sticky rice was just heavenly: moist, rich, buttery, yet so simple. The freshness of the salad helped to complete the meal, and I was a happy camper. Just like Coal. Surf and turf on a Monday, you ask?